Baroque legs, sumptuous colours and the disturbance of who is who inform an operatic presence of woman in the recent video Un et Un by Marie-France & Patricia Martin. For the artists, fiction and reality are complementary. If they work through staging scenes (as in the video Un et Un) they also use photography to capture the real always a step beyond banality (as in the photographs of cities). Their work takes different forms: writing, video, photography, installation and in different ways, they combine these elements to construct the objects of their praxis: the female body, the disregarded historical crafts of woman and the intuition of a feminine space. Marie-France & Patricia Martin are identical twins from Switzerland. They live in Brussels. Recent selected exhibitions: 1996 Cabines de bain, Attitudes, Fribourg. Four Women from Brussels, Danielle Arnaud, London. 1997 Agathe et ses soeurs, Chteau dAubonne, Switzerland. 1998 Stilllife, (solo show) MIRE, Geneva. In Between, (solo show) Guy Ledune, Brussels. Paris London Brussels, Danielle Arnaud, London. 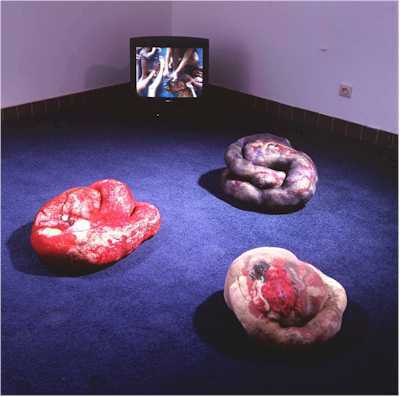 1999 Donner chaud, (solo show) curated by Edith Doove, HAL, Antwerp. Le priv et lintime, Villa Bernasconi, Geneva. Glass Border, Danielle Arnaud, London. 2000 Lire les gens, lire le monde, Editions de la Lettre Vole, Brussels. Lart au foyer, les Tmoins oculistes, Brussels. Images/Video, Guy Ledune, Brussels. La peinture des Martin, curated by Bernard Lavier, part of Voil, le monde dans la tte, Museum of Modern Art, Paris.